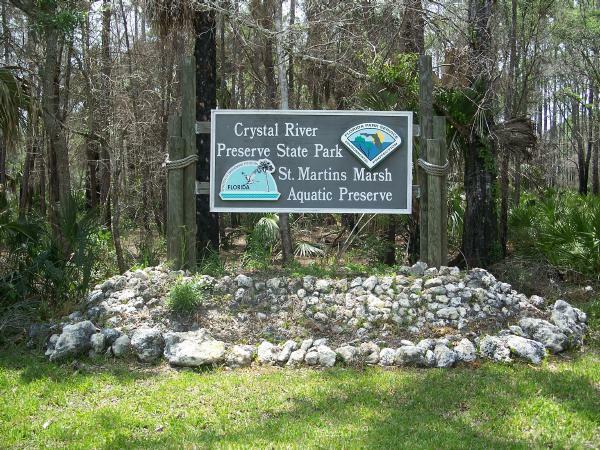 Crystal River Preserve State Park covers 27,295 acres along the Gulf coast from Yankeetown and Inglis to Homosassa, including the area around the mouth of Cyrstal River..The coastline area of the State Park south of Crystal River also includes the St. Martins Marsh Aquatic Preserve. The main public entrance to the park is from N. Sailboat Avenue, which runs south from W. State Park Street in the city of Crystal River. At that location there is a visitor center with a museum and a variety of wildlife exhibits. Aquariums, a turtle enclosure, a xeriscape garden and pond, and restrooms are also available. Docks are provided for power boats, and a kayak/canoe launch is just across from the visitor center. Several boat tours are available at extra cost. A heritage-eco tour takes you on a narrated tour along the dowstream section of Crystal River toward the Gulf of Mexico, including the coastal marsh. There is also a sunset cruise from the visitor center. Both tours are run only at specific times, and are seasonal. Check the state park website (see link below) for the schedule. Advance reservations are usually required to assure a spot on the tours. There are at least six marked nature trails within Crystal River Preserve State Park. The trailheads are at various locations ... so consult a trail map for detailed information about location. One of the trails features a boardwalk. There is also a seven mile unpaved biking / hiking loop trail north of the visitor center. While you're in the area, you may also want to drive to the western end of SR44 (W. Fort Island Trail). The highway winds through the coastal marsh area through Crystal River Preserve State Park, and leads you to the very nice Fort Island Beach, operated by Citrus County. Also at that location are a fishing pier extending into the Gulf of Mexico, and a boat ramp and trailer parking area.